The expanding globalization of knowledge in an era of increasing popularity of the internet and its social media instruments has both positive and negative impacts on our understanding of the reality around us. Recently it has been alarming reports on fake news and misleading information. But how would we judge the quality of information and sort out what is true and what is fake? The question is not easy to answer especialy with considerations to the ever growing complexity of the web of knowledge. Also, our society has changed and will continue to change not only what regards the diversity of news but also the increasing interdependency of the ICT on the contemporary new geologic Epoch the Anthropocene. It is proposed to underline the commencement of significant human impact on the Earth’s geology and ecosystems, including, but not limited to, anthropogenic climate change. Indeed, climate change is just one aspects of the impacts of humans on the Earth’s geology as it is only concerned with the changes in the atmosphere. There are other intensive impacts on the hydrosphere, biosphere and the lithosphere (https://en.m.wikipedia.org/wiki/Anthropocene). With the Paris Agreements and the associated obligations to promote and implement the UN-SDGs there are growing conflicting interests on global, regional and local scales involving setting rules and finding solutions for effective optimization of economic, environment and socials interests. Fake and false news are not new, have exited in previous history and will continue to exist, if not expand and accelerate. Fake news is a type of yellow journalism or propaganda that consists of deliberate misinformation or hoaxes spread via traditional print and broadcast news media or online social media. It is intended to mislead in order to gain financially or politically, or environmentally often with sensationalist, exaggerated, or patently false headlines that grab attention. It uses eye-catching headlines or entirely fabricated stories to increase readership, online sharing and Internet click revenue. It also undermines serious media coverage and makes it more difficult for journalists to cover significant news stories (https://en.m.wikipedia.org/wiki/Fake_news). With Iraqi war and most recently the 2016 Precidential elections in the USA fake news came to be the focus on several levels. One fake news entrepreneur, for example, says we should expect even more Trump hoaxes in 2017 (https://www.google.se/amp/s/www.buzzfeed.com/amphtml/craigsilverman/top-fake-news-of-2016). Hoaxes about US politics were among the top-performing fake news content on Facebook in 2016, according to an analysis by BuzzFeed News. 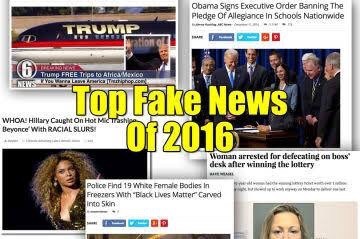 According to this article, twenty-three of the 50 top-performing fake news hoaxes we found on Facebook were focused on US politics. Overall, fake news about US politics accounted for 10.6 million of the 21.5 million total shares, reactions, and comments these English-language stories generated on Facebook this year, according to the analysis. This entry was posted in Uncategorized on August 18, 2017 by farideldaoushy.